Flowers and leaves have always been my biggest inspiration in my art, my Muses as it were. They are my go-to design and a natural choice for me when I wanted to make a whole cloth appliqué quilt. 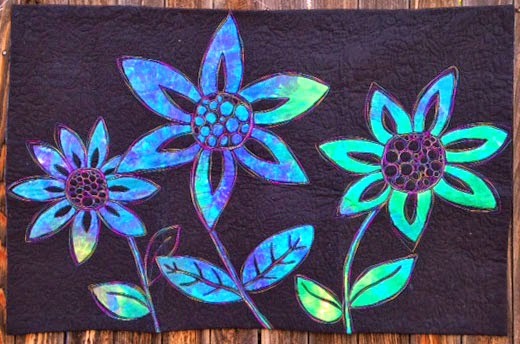 I layered my quilt by Mistyfusing a piece of ice dyed fabrics to 80/20 wool felt, and then used 505 basting spray to baste the black over the the ice dyed fabric. Next I free motion quilted the entire piece, leaving the insides of the flowers open so that I could cut them away and reveal the ice dyed fabric. I am submitting my quilt to the Bloggers Quilt Festival. Follow the link above and vote for your favorite quilts in each category! I love this piece! So glad you entered it! Lisa, Love, love, love this piece. I'm off to vote. Thanks for the inspiration today. I've been thinking about doing something like this and just couldn't get my mind around it. Now I can do it. Wow! Thanks. Very interesting technique and a cool quilt. Beautifully done. Love the blues you used in the flowers, the black certainly makes them pop. Creativity keeps us all looking! Great work! Sounds like a fun technique process. This quilt is beyond wonderful!